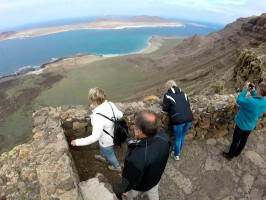 Hiking up to the Volcano de la Corona with his impressive crater and structure and as well his magnificent landscapes on his surroundings. 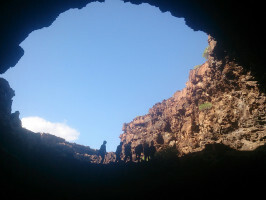 By the way we will know how one of the most impressive lava tunnels worldwide has been created and result of this, 2 unique landscapes has been created in the Canarias: La Cueva de los Verdes and Jameos del Agua. On this trip we will see a natural “Jameo”. We will discover the path of the “Gracioceros” and his history which involves. We will know elements of the Second World War and the war of Cuba which exists in Famara. Also we will learn about the production of natural tincture as the natural carmine and purple colour which is currently recovered. 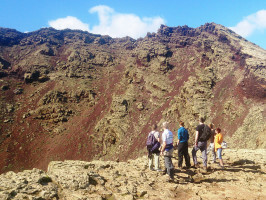 We will also visit the source of Chafariz to understand the culture of water in Lanzarote. On this route we will discover diverse flora and insular fauna. 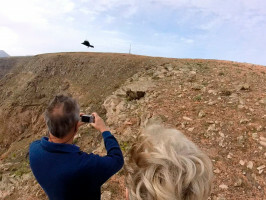 Among the fauna, especially birds, we attempt to see species like the Barbary falcon (Falco pelegrinodes), the kestrel (Falco tinnunculus), the raven (Corvus corax canariensis), the trumpeter finch (Bucanates githagineus amantum) or Berthelot's pipit (Anthus berthelotii). It will be easy also to observe the lizard of Haria (Gallotia atlantica). 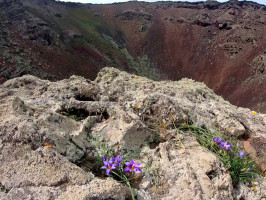 We can identify, always depending on the time of year, endemic plant species such as tarabaste (Allium subhirsutum), the verode (Kleinia neriifolia), the tajasnoyo (Ferula lancerottensis), the tajinaste of Famara (Echium famarae), the vinagrera or calcosa (Rumex lunaria) or bejeque de malpais (Aeonium Lancerottense) among others; native or importance as tabaibas (Euphorbias) or barrilla (Mesembryanthemum crystallinum). The lichens, important in the colonization of the lava, we can see suggestive species such as orchilla (Roccella canariensis or Roccella tinctoria), the escan (Ramalina bourgeana) or the genus Xanthoria. Meeting/pick-up point: Pick up from hotels in Puerto del Carmen, Puerto Calero, Costa Teguise, Arrecife and Playa Blanca between 8:30am and 9:30am. Includes: Material, picnic (water, fruit, chocolate bar), guide, information sheer, photos and or video, pick up and drop off. Dress code: closed shoes suitable for walking on abrasive ground, sunscreen and recommended use of head protection.